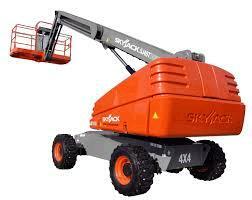 PROUDLY RENTING SKYJACK, JLG, & GENIE. OPTIONS TO INCLUDE CRUSH PROTECTION, GENERATORS, & GLAZIER KITS. * Please call us for any questions on our lift boom str 45 foot 4x4 rentals in Tualatin and Eugene, serving the Portland Metro area, Eugene/Springfield Metro area, Oregon, and SW Washington.